Like Halo 3: ODST, Halo 3, and Halo 2 before it, Halo: Reach feels so very Halo. You jog along deceptively open-ended tracks framed by lush Yosemite Park-like panoramas, veering from one plasma-smeared scrum to the next. Dwarf-sized aliens that look like bipedal turtles crab-walk from behind boulders--shooting gallery targets with the tactical acumen of pinballs. Their brawnier, brainier, more barbaric accomplices eventually show up and take ten or twenty times the damage you can before succumbing. All the while, your gung-ho companions are like deathless automatons--magnets for comically vast loads of alien fire--until, of course, the story requires otherwise. All of which means you're playing a ridiculously unrealistic game of laser tag that's still somehow impossible to pull away from. In fact the best way to play Halo: Reach is to die--lots. Crank the difficulty up to Legendary and dive in. Halo: Reach is at its best when you're tinkering with it, trying assaults (or mounting defenses) from different angles and with different weapons, retrying things that didn't work the first time by adding new wrinkles, testing the game's flexibility, even if it's more or less on par with the original, released nearly a decade ago. Critics are gushing, as they always seem to when a Halo game appears. Predictably prolix, Eurogamer rates Halo: Reach 90 out of 100 and calls its campaign "a solid 10 hours of seismic spectacle that rarely puts a foot wrong in its pacing or design." GamePro awards the game a perfect five out of five stars, calling it "a fantastic swan song for [developer] Bungie," concluding that "the only thing missing from this impressive entry is a number '4' in the title, because for all intents and purposes, Reach feels like the next big thing in the Halo franchise." Writing with a bit less polish (but no less enthusiastically), IGN awards the game an "incredible" 9.5 out of 10, describing it as "a parting gift from Bungie that should keep players entertained through to the next generation...and if any other console shooter can better it in that time it'll be one hell of a feat." The accolades aren't universal. Wired gives the game a respectable (but nearer "good" than "great") 80 out of 100, calling the multiplayer "amazing," but writing of the campaign that "there used to be a big difference between annual, flogged-to-death franchises and event games like Halo, but that line is blurring...and Reach takes a couple of chinks in its armor for retreading ground." Giant Bomb's four out of five star review echoes Wired's, raving about the multiplayer components but shrugging about the story. "If you've played just about any of the previous Halo shooters, you won't be too surprised by what you find in Reach," writes the reviewer. "The pacing, structure, and most of the equipment have popped up in the previous games." "Bungie didn't go 'reinvent the Assault Rifle' or anything silly like that. 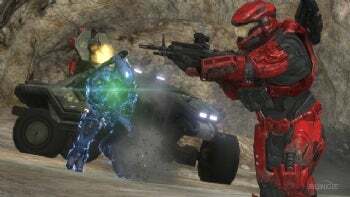 And unlike its past game, Halo 3: ODST, Reach returns to a more conventional format, moving you directly from level to level without any sort of hub world." According to CVG, Bungie doesn't care one way or another, telling the site "we don't get hung up on critics or try to develop titles with reviewers in mind.